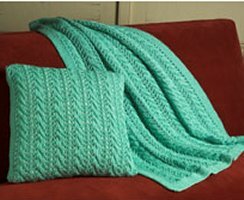 A matching blanket and pillow set featuring an all-over eyelet cable stitch pattern. Pillow Cover Dimensions: 18" x 18"
Throw Dimensions: 32" x 40"
Noro Patterns - 18 Chevron Throw - PDF DOWNLOAD is a similar pattern: home accessory garment, for home, and heavy worsted/aran (16-18 sts/4 in) yarn gauge. You may also like Malabrigo Book 08: In Central Park Patterns - Winterdale - PDF DOWNLOAD, which is another similar pattern: 18 (4.5 sts. / inch) finished gauge and heavy worsted/aran (16-18 sts/4 in) yarn gauge. Hopefully our suggested yarn options for 2650 Eyelet Cable Pillow Cover & Throw can help you come up with your next exciting new project idea!